The boss of Eurotunnel has warned that the firm has just two months to avoid falling into insolvency. The Channel Tunnel operator needs to strike a deal over its £6.2bn ($11.4bn; 8.7bn euros) debt but talks to restructure them have collapsed. It has asked a French court to freeze its debts so it can continue operating. Eurotunnel Chairman Jacques Gounon warned: "If we cannot present plans before the end of September then the end of the story is easy to write." He added: "There will be a liquidation". Eurotunnel has applied to the court for legal protection from its creditors after talks aimed at restructuring its huge debts broke up without agreement. The court is expected to make its decision on 25 July. Eurotunnel has been trying to persuade its bondholders to back a deal to cut its debt pile in half. But a dissident group of creditors has refused to support the proposals. Despite its severe financial problems, Eurotunnel has insisted that it will continue to maintain services between the UK and the continent. Eurotunnel had given itself until Thursday morning to reach an agreement, warning that insolvency was a real possibility if no deal was brokered. It has now applied to the Commercial Court of Paris for protection from its creditors, an alternative to the Chapter 11 bankruptcy procedure used in the US. The process will prevent the firm from defaulting on its debts while a court-appointed administrator tries to put together a survival plan. Eurotunnel's management hit out at a minority group of creditors led by Deutsche Bank, which holds about a third of the firm's debt, for blocking its restructuring plans. "I fail to understand how an institution such as Deutsche Bank has maintained its unreasonable demands without taking into account the consequences on the 2,300 employees and 800,000 shareholders of Eurotunnel," chairman Jacques Gounon said. 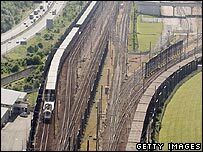 The crisis at Eurotunnel has its origins in the construction of the Channel Tunnel, completed in 1994. The tunnel cost about 14bn euros ($17.7bn; £9.8bn) to build, but traffic has never been nearly as heavy as was originally forecast, hurting Eurotunnel's revenues. 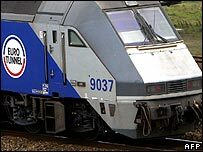 If approved by the courts, the "Procedure de Sauvegarde" would give Eurotunnel up to 18 months of protection from creditors while attempts are made to restructure its debts. It agreed a preliminary restructuring plan with its priority lenders and Goldman Sachs, Barclays, Axa and Macquarie Bank back in May, which would see Eurotunnel's debt cut by more than 50% to £2.9bn. However, some bondholders have complained that they are being offered too little money to support the restructuring, and are seeking a different deal which would leave them with cash and shares in the firm. The bondholders are the lowest-ranked debt holders, very unlikely to get any of their money back if Eurotunnel is declared insolvent. Even if a deal had been struck with bondholders, the preliminary restructuring agreement would have had to be put to Eurotunnel shareholders at an extraordinary general meeting. The meeting, scheduled for July 27, has now been cancelled.